In a meeting that seemed unthinkable just months ago, the leaders met at a Singapore island resort. For all the upbeat talk, it remained to be seen what, if any, concrete results the sit-down would produce. 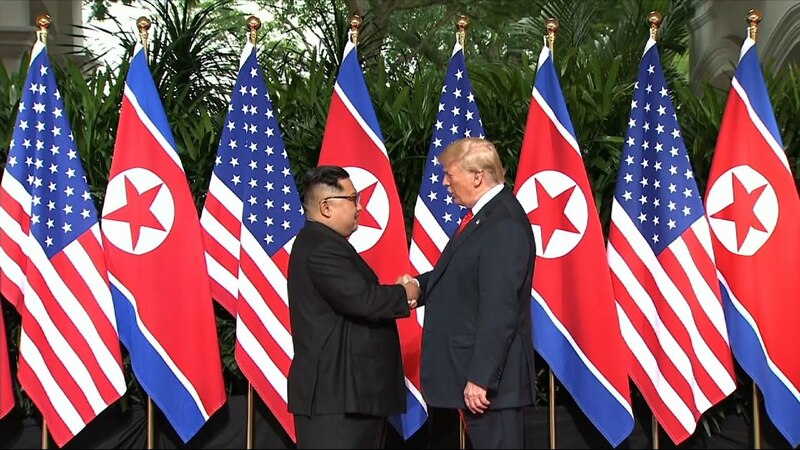 In a meeting that seemed unthinkable just months ago, the leaders met at a Singapore island resort, shaking hands warmly in front of a row of alternating U.S. and North Korean flags. They then moved into a roughly 45-minute one-on-one meeting, joined only by their interpreters, before including their advisers. For all the upbeat talk, it remained to be seen what, if any, concrete results the sit-down would produce. “We are going to have a great discussion and I think tremendous success. We will be tremendously successful,” Trump said before their private session. In the run-up to the meeting, Trump had predicted the two men might strike a nuclear deal or forge a formal end to the Korean War in the course of a single meeting or over several days. But on the eve of the summit, the White House unexpectedly announced Trump would depart Singapore by Tuesday evening, raising questions about whether his aspirations for an ambitious outcome had been scaled back. Critics of the summit leapt at the handshake and the moonlight stroll Kim took Monday night along the glittering Singapore waterfront, saying it was further evidence that Trump was helping legitimize Kim on the world stage as an equal of the U.S. president. Kim has been accused of horrific rights abuses against his people. During his stroll, crowds yelled out Kim’s name and jostled to take pictures, and the North Korean leader posed for a selfie with Singapore officials. Trump responded to that criticism Tuesday on Twitter, saying: “The fact that I am having a meeting is a major loss for the U.S., say the haters & losers.” But he added “our hostages” are back home and testing, research and launches have stopped. As for Singapore, the White House said Trump was leaving early because negotiations had moved “more quickly than expected,” but gave no details about any possible progress in preliminary talks. On the day before the meeting, weeks of preparation appeared to pick up in pace, with U.S. and North Korean officials meeting throughout Monday at a Singapore hotel. The president planned to stop in Guam and Hawaii on the way back to Washington. Trump spoke only briefly in public on Monday, forecasting a “nice” outcome. Kim spent the day mostly out of view — until he embarked on the late-night sightseeing tour of Singapore, including the Flower Dome at Gardens by the Bay, billed as the world’s biggest glass greenhouse. As Trump and Singapore’s Prime Minister Lee Hsien Loong sat down for a working lunch at the Istana house, the president sounded optimistic, telling Lee, “We’ve got a very interesting meeting in particular tomorrow, and I think things can work out very nicely. It was a striking about-face from less than a year ago, when Trump was threatening “fire and fury” against Kim, who in turn scorned the American president as a “mentally deranged U.S. dotard.” As it happens, the North Korean and the American share a tendency to act unpredictably on the world stage. Beyond the impact on both leaders’ political fortunes, the summit could shape the fate of countless people — the citizens of impoverished North Korea, the tens of millions living in the shadow of the North’s nuclear threat, and millions more worldwide. Or, it could amount to little more than a much-photographed handshake. U.S. and North Korean officials huddled throughout Monday at the Ritz-Carlton hotel, outlining specific goals for what the leaders should try to accomplish and multiple scenarios for resolving key issues, a senior U.S official said, adding that the meetings were also an ice breaker of sorts, allowing the teams to get better acquainted after decades of minimal contact between their nations. Trump’s early exit will be his second from a summit in just a few days. Experts believe the North is close to being able to target the entire U.S. mainland with its nuclear-armed missiles, and while there’s deep skepticism that Kim will quickly give up those hard-won nukes, there’s also some hope that diplomacy can replace the animosity between the U.S. and the North.